Updated Thursday December 20, 2018 by Red Circle Hockey. Full team registrations, each player/goalie fee is $85 instead of a flat team fee. 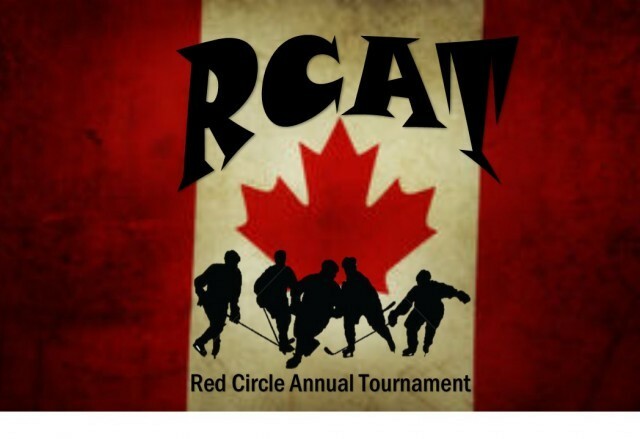 With the assistance of each Division Convenor, the RCAT Committee may add Individually registered players to registered teams. Individual Registrations will also be available to those whose teams do not enter the RCAT. $85 each. These players / goalies will be placed on teams by the RCAT Committee. All forms are downloadable, and can be completed and emailed to the address below or delivered in person. Use the TEAM forms for complete teams and INDIVIDUAL forms if you are entering just your child. As you can see, our RCAT tournament has a different format this year. At our Annual General Meeting this year we received complaints regarding some players not having the opportunity to participate due to limited space on teams that had entered. We were also notified that the organization from Burlington (which typically sends 20 teams to the RCAT) had joined Hockey Canada. This means that they are NOT permitted to send any teams to our tournament. Due to these main influences, the RCAT Committee has spent numerous hours brainstorming ideas that could make the RCAT inclusive of all players. Our goal was to be able to include those players whose teams had not entered the tournament. In a attempt to incorporate the feedback we have received, we have adjusted the format of the 2019 RCAT and make it enjoyable for all. Thank you in advance for all of your understanding moving forward. Please make all money orders or certified cheques payable to : (no personal cheques) cash is accepted as well.